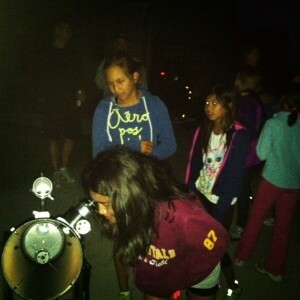 Last night I hosted 21 kids and 14 adults for a star party. Even though the sky was filled with puffy cumulus clouds all day, by sunset they began to dissipate, and we had two good hours of viewing before the fog creeped in across the meadow and brought dew to the telescopes. I was able to show them the moon, Saturn with its rings and its moon Titan, the gibbous phase of Venus, the globular cluster M13, two passes of the International Space Station (ISS), and as a bonus we caught a few Perseid meteors. The kids and adults all had a great time and went home with a new experience and more knowledge about space. The “Dog Days of Summer” is a term used to refer to the hottest time of the hottest season. 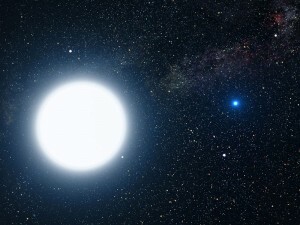 It may make you picture a dog lying in the shade and panting, but the original reference is from the Dog Star, Sirius. A UFO photo from the 80s or a poor shot of Saturn? You decide. 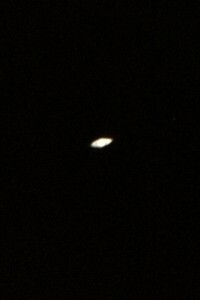 My 12-year-old son and I were the only ones home tonight, so we decided to observe Saturn through my 8-inch telescope. We found it easily enough even though the gibbous moon was encroaching on the view a bit. It got worse as the hour grew on because the sky became hazy and the light suffused throughout the region of the moon like a dusty shroud. 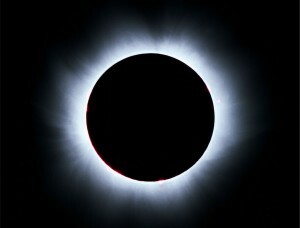 In astronomy, the brightness of objects is measured by a term called “magnitude”. The lower the number, the brighter the object. The category of first magnitude objects are those that range from magnitude 0.51 to 1.50, with second magnitude 1.51 to 2.50, and so forth. Certain objects are even brighter than first magnitude, peaking in negative numbers at their brightest. Often when I’m discussing what gorgeous sky events you should be on the lookout for, I describe them in terms of degrees. 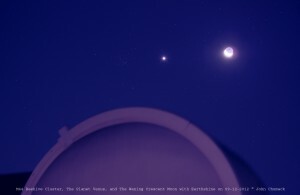 Perhaps Jupiter is just three degrees away from the Moon, or Saturn and Venus have a close encounter placing them only a half degree apart in the sky. But what, exactly, is a degree? This photo was taken by Michael Rael on March 12, 2013 in Conejos, Colorado, USA. 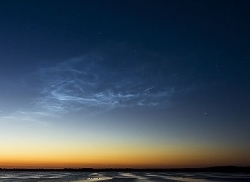 The elusive comet had started edging into northern skies days earlier, but every sunset brought solid clouds. It wasn’t until March 13 that the day was perfectly clear (and cold), leaving me optimistic for a chance to grab the comet that night. Perhaps it’s because Russia is the biggest country on Earth, or perhaps meteors just look at it from above and find it might be a nice place to visit, but another meteor has exploded over the skies of Russia. On the morning of February 15, 2013, a meteor estimated at 1 meter across and 10 tons, barreling into Earth’s atmosphere at a speed of at least 54,000 kph, is believed to have exploded above the Ural Mountains of Russia, 29 to 51 kilometers above the ground, according to the Russian Academy of Sciences. 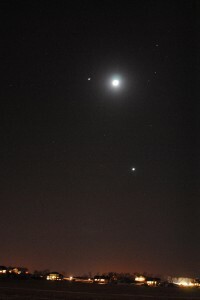 The Beehive Cluster is a dim patch to the left of Venus and the Moon in this photo by John Chumack. Observing nights are few and far between during winter where I live. Not only is it unbearably cold, it is usually cloudy, too. So on an evening that has temperatures above freezing, it’s worth hauling the telescope out for clear skies or stepping out with binoculars on partly cloudy nights to jump from target to target. With bright comets predicted to light up our skies this year, it’s an especially good time to locate those binoculars. You can get a peek at the comets in advance and be ready to track them as they enter the range of unaided eyes. March will be the prime month for the first comet of the year, but while you’re waiting for Comet PANSTARRS, there are a number of other good targets outside right now.